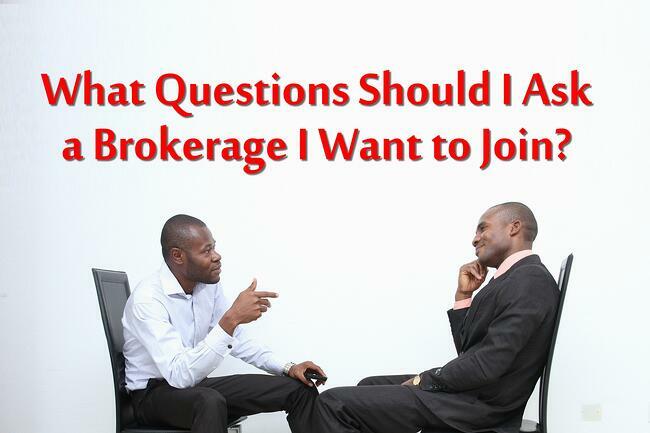 There are so many questions you should be asking prospective brokerages to join. These are 5, but are a good jumping point on other questions to ask. You are here to make money. You should know how much comission you will be getting after every successful transaction. Most companies will offer a 50/50 split, but you should still fully understand their policies. Will the comission split after you close more deals? Will the split reset at any time? In addition to how much commission will go to you and how much goes to the brokerage, you should know how much the fees are and what they are for. Will there be desk fees, marketing fees, annual fees, transaction fees, franchies fees, etc. Is there any training or coaching? Different brokerages will be ideal for different types of agents. Maybe the veteran agents won't need training or coaching and are self-sufficient. While some agents appreciate ongoing education. There are also different policies across brokerages. Are you required to attend? Does training cost extra? What tools are provided to the agents? This applies to both physical and digital tools. Will there be a desk, computer, and printer you can use at the office? Or do you need to supply your own? Additionally, what type of online presence will you have at that brokerage? Some will provide a website, some will provide an online profile, some might provide a CRM. Find out what is provided, so you know what tools you'll have to invest in yourself. Will I be provided real estate leads? This should be super important to you, because leads help you reach your goals. Let's say you convert 5% of leads to clients, and you have a goal of 30 transaction this year...that means you will need to generate 600 leads this year...will the brokerage provide that? Or will you have to do some marketing on your own? Regardless of what your brokerage offers, Zurple can compliment the tools nicely. Learn more!